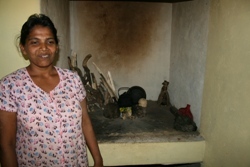 We have funded families to rebuild houses in Unawatuna. Other families have carried out major repairs to their homes with our support. Initially it cost £2,300 to build a two-bedroom house but building costs have risen and now it costs nearer £5,000. Each family was responsible for their building work but were assisted by a qualified engineer who monitored progress at each stage. They are able to extend their properties as they get back on their feet again. All the families have completed their rebuild and repair work and have settled into their new homes. They all look impressive and the families are very happy to have their homes back. Two of the families decided that they did not want to live near the sea anymore and their children suffered from nightmares. They were lucky enough to have some family land away from the sea that they could build on. The other families have built on the original site of their homes. We have also built new houses in Tittagalla East. The new houses have been “life changing” events for these families. They lived in decaying housing which was often temporary. It was hard to keep them clean and dry. As a result, the children were suffering from illnesses. Tittagalla East is a poor area with many wattle and daub and wooden plank houses which deteriorate every time it rains. It is tragic to see families living in them. In return for the new house, families agree to cultivate the land around their houses to provide food for themselves and also for resale. The land is generally fertile.